We believe business can and will transform the world in positive ways, and that as a business school we amplify this effect through strategic collaboration. 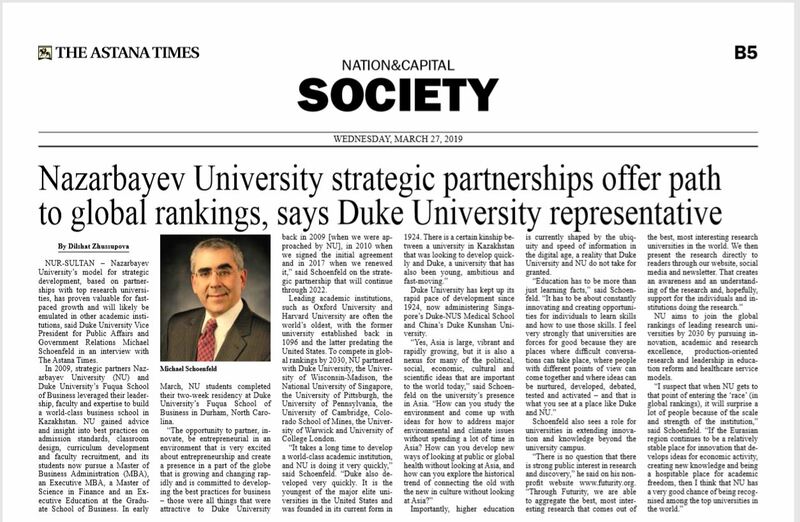 Institutional partnerships enable us to share our strength and experience in curricular and program design, teaching and research, best practices in governance and program delivery, recruiting and hiring world-class faculty and staff, and enrolling the best students around the world. Since 2009 Fuqua has been playing an important role in the development of one of Kazakhstan’s most prestigious institutions: the Graduate School of Business at Nazarbayev University (NUGSB). Kazakhstan, whose natural resources have driven rapid economic development, is in the midst of comprehensive education reform. In 2009 the newly built Nazarbeyev University, on the cusp of accepting their first undergraduate students, approached us for consultation on developing a world-class graduate business school. Together Fuqua and NU completed a market study, demonstrating the feasibility of creating such a professional school for the region. Since 2012 Fuqua has been a strategic partner to NUGSB—offering advice and insight into best practices for everything from classroom design, to admission standards, to curriculum development and faculty recruitment. NUGSB now offers full-time and executive MBA programs, executive education, a master’s of science in finance, and a master’s in engineering management. All degrees awarded are solely from Nazarbayev University, though the university’s many programs benefit from its international alliances. It is not often that a faculty member has a chance to be part of such an ambitious academic undertaking, in a way that will impact generations of global business leaders to come.